"When we enrolled our daughters in Mathnasium of Apex it was to ensure a strong mathematical foundation that would allow them to build their skills and conquer trouble areas. What we have found was an unexpected benefit, not only did they develop an enthusiasm for math but a confidence that can be seen across all of their subjects! The entire staff from tutors to management create a "can do" atmosphere that has had a tremendously positive impact on our girls!" "Our daughter always has a positive experience at Mathnasium. The staff knows how to engage each student where they are and work the plan based on their specific needs. We are very pleased with Mathnasium and recommend them as a trusted resource for academic support and growth." "My daughter brought her math average up 10 points in a month and has started the second quarter off with flying colors. I had anticipated a struggle getting her to go to the sessions, but she is more than willing. The nightly hours of math-homework have melted away because she receives hands-on help from the staff, whom she likes, instead of searching the internet for answers. I was concerned she would not be able to juggle the tutoring with her extra-curricular activities but going to Mathnasium actually gives her more free time. And she has gained enough confidence to ask questions in class as well. My husband and I couldn't be more pleased! Thank you!" "My daughter's confidence in her math skills has already increased, and she has only been there for for six weeks! She loves her tutors and actually ENJOYS going to study there! And everyone is so friendly and helpful! Thank you!!!" "I have seen my child become more confident in his math classes due to the extra help he receives at Mathnasium!!!!" "Hannah and the rest of the staff are committed to my daughter doing well in her math class. They are patient, accommodating, and encouraging. Not every child will need assitance in math, but if you find or believe your child does, then this would be the place to trust in making sure your child gets the additional help and support they need." "My son loves the atmosphere at Mathnasium. He likes the classical music that is played. He also mentions how much he likes being able to work on problems on his own but that there is always someone there to help him when he gets stuck"
"The material and the teachers have really helped my daughter grow in the area of math"
"Being a part of the Mathnasium of Apex family has been the most rewarding experience. Dr Wade, Ms. Hannah, and their staff of instructors are all very passionate about teaching math. They are an absolutely invaluable resource for students of all ages who seek the extra help and motivation. Having my son attend the Mathnasium of Apex is one of the best decisions we made as family. We cannot be thankful enough!" "I just love the personal attention my child gets. I can talk to Hannah anytime I want to and she is very responsive to my questions...and always patient and willing to hear me out." "Our son benefits tremendously from Mathnasium. From helping with his homework to getting him brushed up from the summer break to giving him a strong start for each course he takes, it is an awesome program. Very relaxed environment and convenient hours. Super!" "My son loves to go to Mathnasium and is excited about learning more math"
"Our experience has been great- there is careful planning that goes into each students success. Employing strong and personable tutors has been their strength- tutors that are not only good at math, but can approach it in a non threatening way that makes the concept at hand seem less intimidating!!" "Our family moved in the middle of the school year, and we found that our daughter had a gap in math skills due to the curriculum change. This shook her confidence and she became very negative about math. After about 12 weeks at Mathnasium, her grades had improved from C's to A's and her confidence soared. She also moved into the advanced math track the next school year. The staff at Mathnasium has always been professional, responsive to our questions and requests, and very patient. 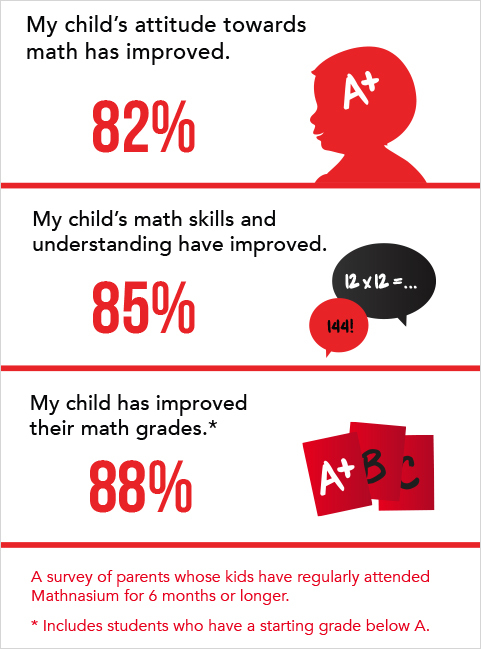 We are glad we tried Mathnasium and recommend them to anyone with a child who needs to strengthen their math skills." "Mathnasium has been an excellent resource for my three children. Whether it was for tutoring, enrichment or preparing them for the E.O.G.s, Mathnasium has made learning easy and fun for them. I saw my children excel, gain confidence and they loved watching their own grades "soar." All of the instructors care about the children and help formulate a plan so that every child can succeed. I am grateful for everything Mathnasium has done for my children and always recommend it to everyone whether it is for helping a child who is behind, or just keeping them way ahead and challenged!" "This is the second year we have worked with Mathnasium of Apex. Our daughter has been very happy with her tutors. The staff have been awesome with scheduling and we have been delighted with the grades our daughter has been receiving. Mathnasium worked for us!" "I wanted you all to know that my daughter has pulled her quarterly grade up from an F to a C at this time. She is only one point away from a B average, which is her goal for the last quarter of the year. She could not have done that without each and every one of you. I applaud you on your dedication not only to my daughter but to all the children you tutor within Wake County. We all know they are our future and how important it is that this generation have a strong foundation in math." "Words can not begin to tell you how grateful we are to have found Mathnasium in Apex. If it were not for Hannah and the other tutors I know for a fact that my daughter would have failed the 8th grade EOG and math for the year. She has always struggled with math and when her teacher went to another school mid way through the year, it proved devastating for her. We came to the Apex center in May when we received her interim and she was failing the class and EOG's were less than a month a way. Your entire staff is so friendly and each one of them had a part in helping her but Hannah really went above and beyond. Not only did she teach her the math but she did something that no teacher up to this point has done; Hannah believed in her which gave her the confidence and belief that she could do it. I am very Happy to say that she not only passed the math EOG but she passed it with a 4!! I can say without a doubt that this would not have happened if it weren't for Hannah and the staff at Mathnasium. Hannah has devised a plan to review everything with her over the summer to get her ready for 9th grade and has told her that their goal for the first semester is to make an "A" and I believe she can do it. You are very blessed to have the staff that you have at the Apex location and we will be forever grateful!!!!! If you need anyone to give a referral, please don't hesitate to let me know."